The FiddlerHook Firefox add-on points Firefox at Fiddler, avoiding the need for manual configuration or restarting Firefox. In Firefox, click Tools > Add-ons > Extensions. Next to FiddlerHook, click Enable. Click Monitor with Fiddler on Firefox's Tools menu (or in the status bar). Choose an option to control how Firefox should use Fiddler. The option "Force Traffic to Fiddler" will attempt to send traffic to Fiddler regardless of whether or not it's even running. 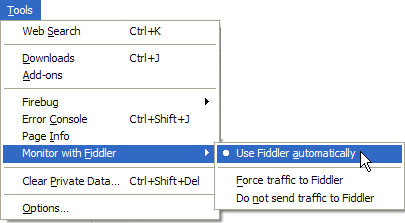 The Use Fiddler Automatically option will emulate IE's behavior: traffic will be sent to Fiddler only when Fiddler is running and is in "capturing" mode. 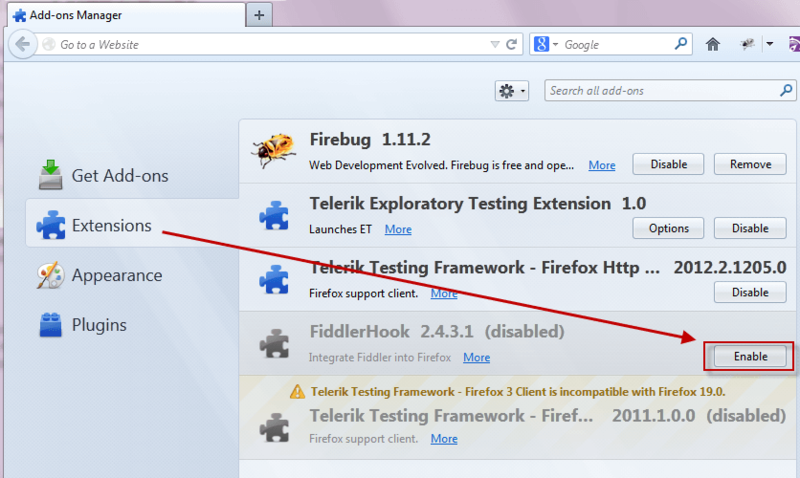 To add the Launch Fiddler button to your toolbar, right-click the Firefox toolbar and choose Customize. In the dialog that appears, drag the Fiddler icon to the toolbar location of your choice. Removal Instructions You can use Firefox's Add-on Manager (on the tools menu) to disable the FiddlerHook addon. If you would like to remove the FiddlerHook add-on altogether, you can simply delete the C:\Program Files\Fiddler2\FiddlerHook folder.